Deck Solutions LLC provides the most convenient and affordable method of deck restoration, cleaning and deck sealing, and we also offer cleaning and sealing of fences and patios in the Chicago land area. Our mission statement is simple, to bring superior and reliable services to our clients combining nontoxic, environmentally safe and biodegradable products with top of the line equipment, and a professional workforce committed to excellence. 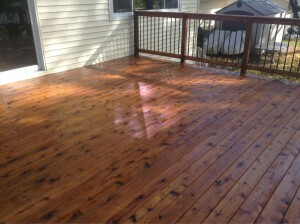 Deck Solutions LLC is staffed by professionals who are experts in maintaining the beauty of exterior decks and patios. A deck solutions expert will come to your home to give you a no cost no obligation evaluation to determine your outdoor restoration needs.